On the outskirts of London, at the edge of Epping Forest, lies the site of old Wanstead Manor, which belonged to Elizabeth I’s favorite Robert Dudley and, in turn, his stepson, the Earl of Essex. A century later, Sir Richard Child, Earl Tilney built what was called the ‘noblest’ Palladian mansion there. Its magnificence entertained the Prince Regent, provided a fitting temporary residence for the refugee Bourbons and served as a backdrop for epic celebrations of Wellington’s victory over Napoleon. Wanstead House was the crown jewel of a Regency heiress’ fortune. Catherine Tylney Long was the ‘Wiltshire heiress’ in possession of Wanstead House. Against the advice of her relations and his, she married the notable rake William Wellesley-Pole, a nephew of Wellington. The progress of their courtship and disastrous marriage has been well-documented–a perfectly cautionary tale against reforming the spendthrift libertine. As for the marital abode, Wanstead House, its demolition and dispersal makes an informative study of Regency-era creative financing. Wellington tried to save the estate for the unfortunate offspring of the ill-fated match–a mighty effort that kept the Court in Chancery as busy as the one portrayed in Dickens’ Bleak House. 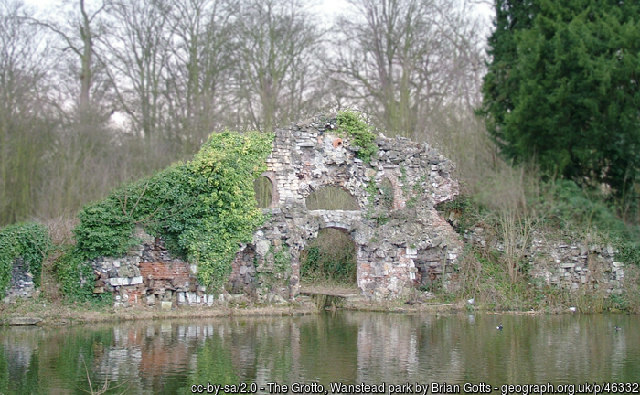 What remains of Wanstead House is the beautiful park containing the ornamental waters once connected by picturesque bridges, the Temple and the Grotto, and surviving portions of tree-lined avenues. Author John Harris, “No Voice From the Hall” recollected that only pits from the Wanstead House cellars remained. This is the ruined grotto on the grounds. The best remnants of Wanstead, however, were sold in a famous 32-day sale the rake held of his wife’s belongings. 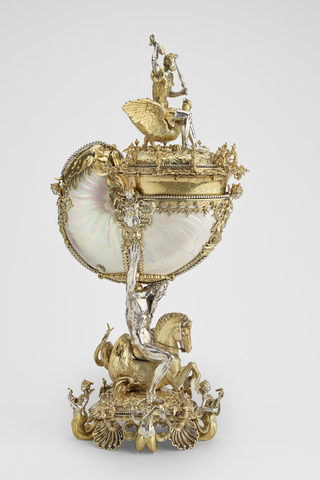 These heirlooms are still selling today in the most exclusive auctions in the world, giving a glimpse of the fine objects that once adorned the great Regency-era houses. 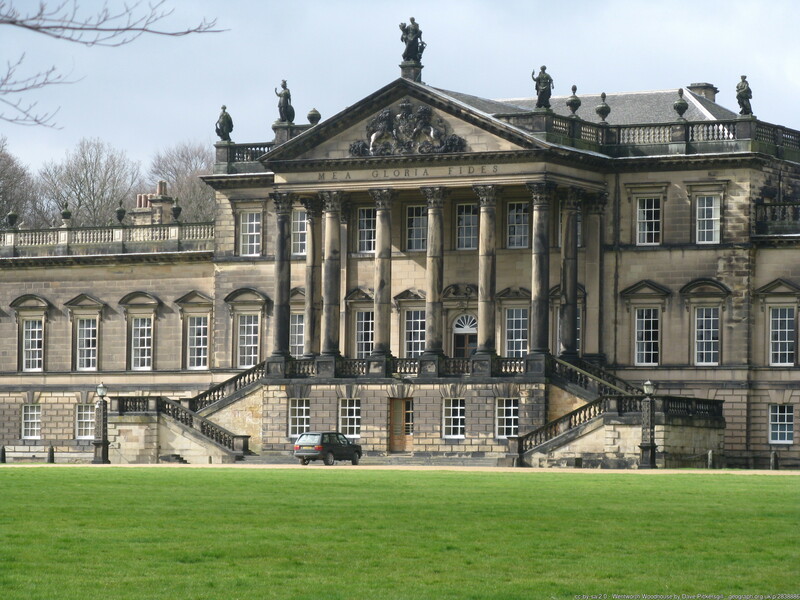 This entry was posted in Regency, Uncategorized and tagged Bleak House, Catherine Tilney Long, Chancery Court, Earl of Mornington, Nautilus Cup, Wanstead House, Wellington, Wentworth Woodhouse, William Pole Tylney Long Wellesley by Angelyn. Bookmark the permalink. I lived in Britain as a child and experienced an extremely peculiar occurrence there at least 30 times. I would wake in the middle of the night ( I was 4 years old) and sometimes I would get a high pitched buzzing in my ears. When this happened I was terrified, for at the door to my bedroom 2 figures would appear. They were very similar, although one was a fair bit taller than the other. Both were draped in glowing white robes from neck to ankle and had shoulder length golden hair, blue eyes and rosy cheeks. They would glide noiselessly over to my bed and stand there , staring straight ahead, with similar benign expressions . They were near enough for their robes to be touching my bed and would remain there for several minutes. Then they would glide silently away and simply fade away to nothing. I was absolutely terrified, even though they did not make me feel threatened. As say, this occurred about 30 times. When we came to Canada in 1959 it no longer occurred. I had not thought about it for years until I saw , under the heading “Radiant Boys”, an extensive article about the very thing I had seen, there on the Internet. Guess who believes in ghosts now?